The Wheels’ unique style was forged in the subway stations and farmers’ markets of Boston, where the informal setting and ever-changing audience created an ideal environment for musical experimentation. They honed their craft with bulgars and 90’s pop covers for the morning rush hour and mixed doinas and zhoks with fresh produce on the weekends, building a community of fans and friends across the city. On the advice of an admirer from the Porter Square T station, they entered the 2012 Boston Jewish Music Festival’s “Klezmer Idol” competition, winning first place and a recording session. Seven months later, with a brand new EP under their belt, they won both the jury-awarded City Winery Prize for best klezmer ensemble and the Audience Pick Award at the third biennial International Jewish Music Festival in Amsterdam. Ezekiel’s Wheels features Abigale Reisman (violin), Jonathan Cannon (violin), Kirsten Lamb (upright bass), Nat Seelen (clarinet), and Pete Fanelli (trombone). For more information about the musicians and individual biographies, click here to visit the band members page. The Wheels perform regularly across New England, occasionally around the United States, and every-so-often around the world. 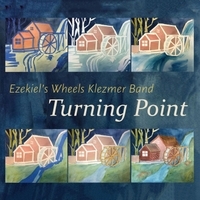 For a concert calendar and more, see www.ewklezmer.com.